The Tea Party may yet ride again. There are two new polls of the Mississippi Senate primary - one released by a Republican pollster showing Thad Cochran with a slim 5 point lead (45%-40%), and one from a Democratic pollster leaked to TPM's Daniel Strauss showing McDaniel ahead 46% to 44%. Given margins of error and the inherent difficulties of polling a party primary in an off-year election, to me, these two soundings tell pretty much the same story. And it's an amazingly bad one for Thad Cochran on a couple levels. On the first level, you don't want to be under 50% when you're getting primaried and your supporters pretty much by definition have a lesser enthusiasm and motivation level than your opponent's. But beyond that, I'm stunned that the Cochran campaign has managed to get so little mileage out of the whole "Constitutional Clayton" debacle. 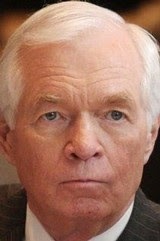 McDaniel probably wasn't behind the decision to break into the nursing home where Cochran's invalid wife lives. It's almost unimaginable that anybody other than a few isolated doofuses could have thought this was a good idea.